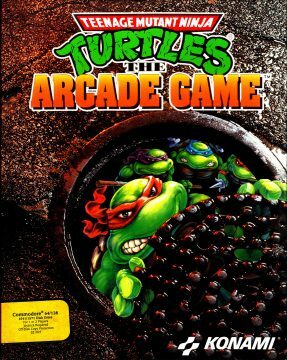 In October of 1989 across all arcades in North America and Europe, the game that would solidify Teenage Mutant Ninja Turtles‘s place in gaming and set the standard for the beat-em-up genre going forward was released. The aptly titled Teenage Mutant Ninja Turtles allowed players to take control of the four mutant teenagers at the same time, leading to awesome mayhem and lifelong memories. 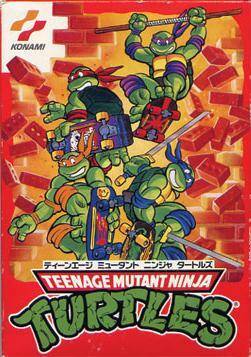 It was released several months later in Japan, and was the first TMNT affiliated product to actually bear its original name there. 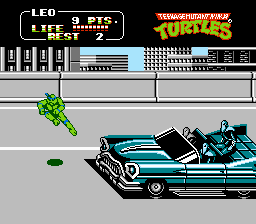 Contrasting the NES’s somewhat inconsistent portrayal and daunting difficulty, the arcade game was stylistically grandiose, featuring visuals, music and locations right out of the 1987 cartoon series in a beat-em-up that perfectly fit the heroes in a half shell. There was no mistaking who, what or where players would find themselves in this game, everything was tailor made for the fans in order to give them the best experience possible with the foursome. 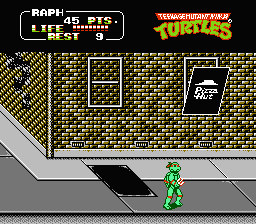 Teenage Mutant Ninja Turtles didn’t enter the market without some fierce competition either. The beat-em-up genre would see something of a resurgence in 1989. Even though the release of Double Dragon in 1987 opened the doors to hundreds of brawling action games, few attempted to move the genre forward and over just two years, it was by that point getting stale. In the summer of 1989, Konami themselves had already released Crime Fighters and Special Project Y, both of which were mediocre at best. But 1989 would usher in a golden age of beat-em-ups, with Golden Axe being amazingly successful, DJ Boy truly bringing hip-hop to the kids and Final Fight right around the corner. 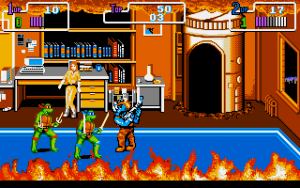 Despite the many other memorable, fantastic games released around it, it’s arguable that Teenage Mutant Ninja Turtles is the one that is today most fondly remembered as well as the one that has aged most generously. The general plot should sound quite familiar by now. The TMNT receive a distress call from April ‘O Neil and the brothers go to rescue their news reporting friend, only to find themselves lured into a trap with April as bait. Now Master Splinter is also gone, and Shredder issues a challenge to the Ninja Turtles to save them by going through the Foot Clan. This leads the three fingered quartet on a wild ride throughout New York City to save their friend and master while saving the city once again. The urban adventure takes you through the city itself, from the burning apartments to the sewers and downtown Manhattan. There is even a level where the radical greensters go skatin’ down the highways at blurring speeds. 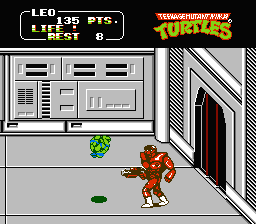 Going underground, they also eventually encounter the Technodrome for a final showdown. While it is almost entirely based on the cartoon, there are a few nods for the comic book fans to be found, most notably April’s burning apartment, a central plot point in Teenage Mutant Ninja Turtles #10, and also featured in the first live action movie released in 1990. The big selling point of this game is precisely what it should be, the ability to play as all four brothers at the same time. With three friends, there was guaranteed melee to be found in the game with non stop action and interactive environments. Numerous elements were put into the game to make usefulness of the cooperative nature of the game, uniting the players together in their cause. Enemies now consist exclusively of foot soldiers and other Dimension X beings recognizable from the cartoon series, and they are a clever bunch themselves. The Foot soldiers act together, often sneaking up behind the turtle to hold him down while another Foot scores some free strikes to the beak. This calls for the other players to come to the rescue, helping out their “brother” in need and have their backs at all times. Players are free to join in at any time into the game by inserting coins to the machine. The four brothers all have their unique traits. 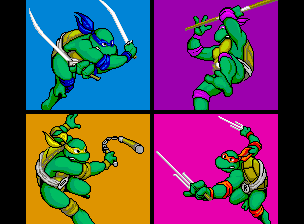 Leonardo is the balanced and average leveled turtle, Michelangelo has greater strength but shorter reach, Donatello has the greatest strength and longest reach though is the slowest out of the four and Raphael is the fastest but also the weakest. Beyond these abilities, their style of attacks remain fairly similar all around, with a short string combo of strikes if the attacks land without interruption. 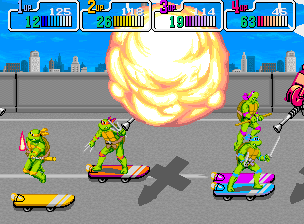 Each turtle also have a special move which comes at a cost of some energy, but is essential when it comes to breaking up a flock of Foots or dish out some extra pain on the bosses. Raphael is the only character with an exclusive special move, performing a rolling kick while the others swing their weapons with immense force. Walls and objects can also be used to your advantage, with walls jumps to serve a well placed fly kick and cones, light posts and fire hydrants all being available to your use against the Foot. Foot soldiers can even be thrown around and into walls. 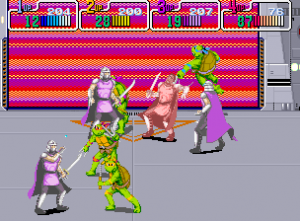 There is actually less variation in terms of number of different enemies in the game compared to the first NES game, but the way it uses the large Foot Clan is quite ingenious. The robotic ninja army comes in many different shades literally, as the many different colors all have different attacks and approaches. Yellow Foot will throw boomerangs, White Foot strikes with a katana, Purple Foot goes hand to hand and etc. 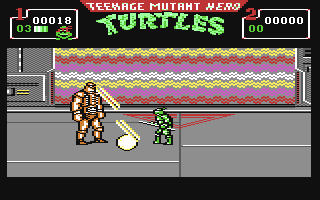 The different colors lead to a good varied set of foes to encounter, and their disposable nature in the cartoon makes them perfect turtle fodder in a game such as this one. Technodrome’s mechanical menaces doesn’t end with just Foot soldiers, as there is also Mousers and Wheel-Bots to fight along the way. 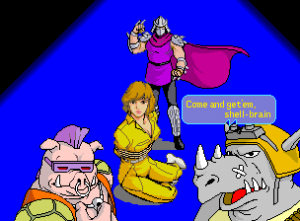 The cast of bosses also consist entirely of recognizable names and appearances from the show, with Rocksteady, Bebop, Baxter Stockman, General Traag, Lieutenant Granitor and the very welcome addition of Krang, who was sorely missed in the NES game for many fans. Shredder of course acts as the main villain of the game. One of the reasons for its immense success was how straightforward the game is, allowing pretty much anyone of any age to be able to enjoy the simple joy of bashing in the heads of thousands of Foot soldiers with relative ease. While this is in most ways good and part of its lasting appeal, it is also requires little to no strategy at all, and is larger a quarter muncher. This is one of the few issues that can be found with the game for some of the more experienced players hoping to seek out a bit more challenge for their spent quarters and dimes. It also suffers from something that would plague Konami brawlers for a few years to come – floaty hit detection. Now it’s not like the game does not detect the hits correctly, it does, but it is the way its visually represented on screen. There’s little weight to the strikes of any of the characters, making the whole game feel more like a session of therapy with Dr. Marvin Monroe’s aggression mallets. Compare the strikes within this game to a game like Final Fight, and you’ll see a visually more satisfying effect to the attacks, and heavier sound effects accompanying that as well. This issue plagued several Konami games to come, such as The Simpsons. The lack of greater variation in your attacks also bogs down the game a little. With little true strategy needed, it becomes a bit of a bland experience eventually as you mash buttons and see the same four strikes over and over, with only a special move to spice things up here and there. Other games out at the time or only a month later, such as Golden Axe and Final Fight had diversity between the selectable characters to keep things a bit more fresh, so in TMNT, each turtle feels a bit too much alike, though the fun of playing all four simultaneously keeps that negative at a minimum for the most part. But where the game truly succeeds is in its presentation. Konami at their height were probably the very best at capturing the spirit of the source material in their licensed products, even better than Capcom’s stellar Disney and movie tie ins released at the same time. The graphics are colorful and lush with distinct charm, using a very similar color palette and art direction as found in the cartoons, being an early example of a product that comes very close to being a true interactive experience of a cartoon. Expressions, animations and other visual cues are taken straight out of the animated series and put to great use. Even though it is now over 20 years old, its graphics hold up well even to this day. 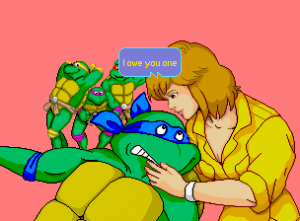 There are several small cutscenes moving the plot along looking almost as good as the cartoon, and there is even some action between a turtle and April if you’re into that sort of thing. The music is all as much of a part of making this game as success as anything else, and the soundtrack is in simple terms absolutely awesome. 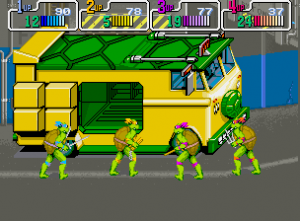 Composed by longtime Konami employee Mutsuhiko Izumi with assistance from Miki Chang, TMNT‘s sound is one with driving percussions and energetic synth leads, splicing the cartoon’s theme song in and arranging melodies around it. Izumi cleverly uses the famous motif of the theme song to his advantage to draw in the attention of bypassing gamers to notice the game, at the same time as he maintains a very recognizable personal style. In addition to including several songs right from the cartoon itself, the original tracks are fantastic and well fitting, never feeling out of place in any regard. The sound driver is in its early stages for this particular game, so the overall volume of the samples are a bit overwhelming and the leads a tad overpowering on the overall sound. There is also a hidden track within the game’s source code, which was to be used in countries where the main theme’s rights were not cleared, but it went unused. Izumi would continue this style of composition for several of his next titles, such as Asterix, The Simpsons and later his return to TMNT in Turtles in Time. 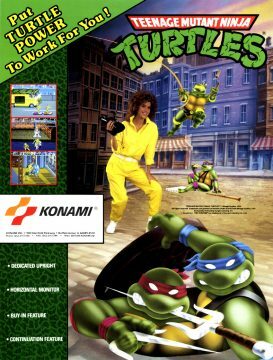 As with most of Konami’s soundtracks, TMNT would see a CD release on the compilation Konami Special Music 1991 Golden Treasure Chest the following year. The unused track is featured on this CD, though it leaves out music taken straight from the show. It was the success of this game that led to Konami’s many licensed titles in the early ’90s. The amazing success of the game led to Konami acquiring Simpsons, Bucky ‘O Hare, Zen Intergalactic Ninja and many more in order to capture as many of the red hot properties to create a video game tie in for. The engine and board which TMNT was based on would be used to create many of the games for these various franchises, and as mentioned, TMNT would return later to once again kick some shell in the arcades a few years later on. 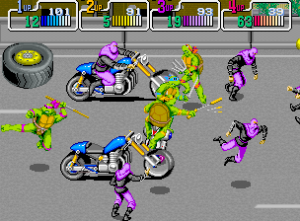 After the 2003 relaunch of TMNT, Konami produced new games based on the new series. On the second game based on that series, called Battle Nexus, this game is unlockable in emulated form. The music and 1987 imagery was changed to avoid licensing issues with Fred Wolf Films who own the cartoon series. The result is altered music and other modifications to tie it in with the new cartoon. It runs fairly well, though it has a tendency to slow down. The GameCube version does not feature the NES port as sometimes rumored. In 2007, the game was released again for the first time as an arcade perfect port on the Xbox Live Arcade service. Due to licensing issues, the release was somewhat rocky in terms of fan reception. Developed by Backbone Entertainment, known for somewhat shoddy emulations, it replaces the interface using new materials from the 2007 movie. It also has some weird bugs in online multiplayer where only the host can see the ending. Certain modes also limit the number of credits, although they’re generally more than enough to finish the game. Despite these little nostalgia breaking setback, the online enabled brawler was a fairly good release and highly successful, topping the downloadable charts upon release. Teenage Mutant Ninja Turtles was successful enough at the arcades that it would see numerous home console ports, much like the first NES game before it. Out of the many versions available across many platforms, none was as successful and as good as the NES version would be. It took well over a year for it to be released on the console after its release at the arcades. Some changes were made to the overall plot. 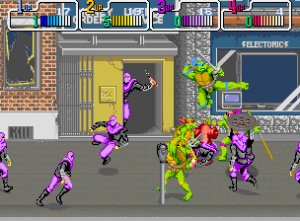 By the time Teenage Mutant Ninja Turtles 2: The Arcade Game saw its release on the NES, the live action feature film had been rocking the theatres around the world and found immense success with the audience, becoming the most profitable independent movie of all time (until The Blair Witch Projectbeat the record in 1999). 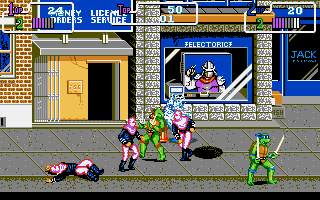 Due to this success, the NES version actually presents itself as a sequel to the movie, mentioning the climatic ending in its manual and detailing Shredder’s survival and return. This gives the sequel status a duality, as it can be seen as a sequel to the first game, or rather continuing the movie’s storyline and distancing itself from the first NES outing. 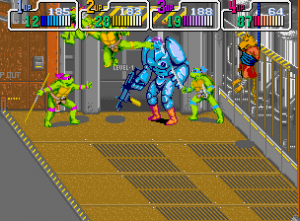 Aside from that added detail, the game remains nearly identical in story to the arcade edition. 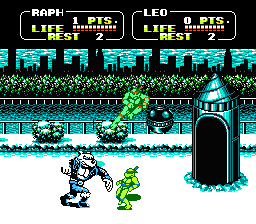 Not being able to handle all four players at once, the NES version is now adjusted to suit a more controlled two player experience, with fewer onscreen enemies and overall graphical detail. Like most arcade ports during this particular time, the technological gap between the capabilities offered on the NES and arcade was so wide that home ports often required to be modified significantly to offer a more tailored and appropriately sized games to play to the “strengths” of the home console. 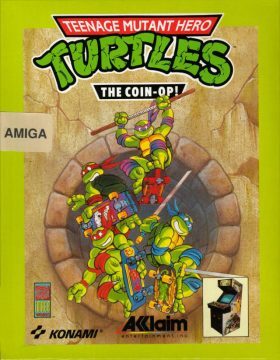 Sometimes this just led to mediocre ports like SNK’s Athena which were just too hard due to their coin-up nature that didn’t translate well into a home product, but luckily for TMNT, the NES port of the arcade game was among the best ever offered on the system. Naturally, the biggest dive comes in the graphical department, with smaller sized sprites with less overall details, and less activity on screen. That’s not to say the game looks worse than its arcade counterpart however, because it’s still one of the better looking NES games, and with a more faded color palette the whole game makes the general tone of the game a bit more effective rather than overly cartoony. Even more impressive is the added amount of levels and music in this version. Konami didn’t settle for just moving the game over to the platform, they added two full new levels, each with their very different look, enemies and bosses exclusive to the NES. These levels add much value to the overall game as well as new plot points. 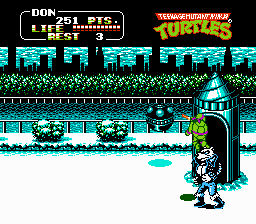 The first of these is a snow covered New York City boardwalk, due to a weather modulator used by Tora, an all new wolf mutant affiliate of the Foot Clan. The Foot, always quick to adapt, have various enemies and vehicles based around ice and snow to stop the turtles in their tracks. The second of these levels is an all new magic dojo, acting as a hideout for Shredder and the path to the Technodrome. This stage is filled with sharp bamboo spikes piercing through the floors as well as magical tigers, before facing off against Shogun, a mechanical shogun samurai. 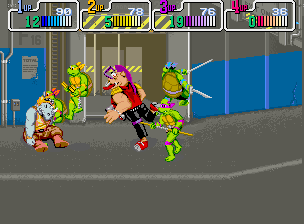 Both Tora and Shogun were designed by Kevin Eastman specifically for this game and never appeared since, but Shogun has been noted to be a potential precursor to Chrome Dome who would later appear in the cartoon and in Tournament Fighters on SNES. 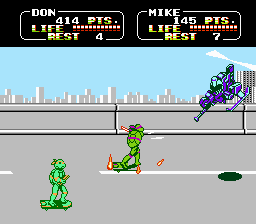 Tiny Cartridge revealed that the unnamed Skateboard girl which rides the streets of the second stage in The Arcade Game, made an unlikely and very well hidden cameo in the 2009 game Contra Rebirth. 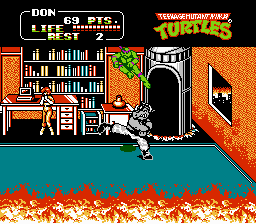 In TMNT, the girl is interactive and screams a terrifying haunting scream if the player slashes in her direction. Between 1989 and 2009, she was never seen in any other game. Her cameo occurs during the second stage of the game in a crowd of fleeing civilians, slightly updated to fit the graphics of the other characters on screen. M2, the developer of Contra Rebirth, is mostly comprised by young talents from Japan and the US, so it is most likely the case of someone wanting to sneak in an obscure cameo to see if anyone would notice. Baxter Stockman appears twice in this game, both in human form and his mutated fly form, replacing Rocksteady and Bebop as the dual bosses during the 4th stage. Rocksteady and Bebop appear in their respective places as singular bosses. The one thing that probably carried over the most appropriately is the soundtrack. The 2A03 conversion lives up to the arcade soundtrack with grace and even builds upon it by adding all new tracks for the exclusive stages. While the original songs revolve around the famous theme song to draw in attention from bypassers around the arcade cabinet, these new NES songs have a chance to prosper beyond that, adding a rich new sound that makes the new stages all the more exciting and memorable as they engage themselves more emotionally than commercially in composition. Certain tracks such as the Technodrome stage sound even stronger on the NES with a cleaner sound and stronger percussion, a fine showcase that technical limitation can provide a superior product. 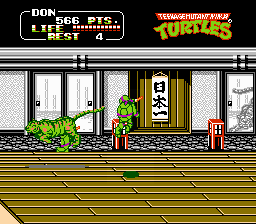 The arcade game also had a lack of strikes to mix things up, and sadly the NES has even less, removing the throw altogether and giving Raphael the standard special move rather than the sliding kick from the arcade. Luckily the floaty feel to the attacks is fixed on the NES, adding a much appreciated sound effect and recovery time for each strike. While there’s a more perceptiable blowback after attacking an enemy, they’re also invincible for about a second, so you can’t execute a consective attack immediately, as it’ll pass right through them. The lack of a varied arsenal of strikes means less overall strategy, which leads the game to become somewhat of a glorified button masher. While the loss of four player simultaneous action does moderate the game into a somewhat slower experience, the two player feature proves itself to be a fully functional and bonding experience, with a good varied amount of aesthetics and action to keep the game interesting. The Arcade Game still stands as one of the best arcade conversions on NES, and is dearly beloved by fans, having aged just as gracefully, if not even better, than the arcade edition. As with most Konami games, the Konami code can be performed for some extra lives. Pizza Hut ran a campaign with the game that included packed in coupons for pizza in their restaurants, as well as in game product placement, one of the first examples of this on the NES. This commercial tie-in was removed from future ports and the coupons were not included in the European and Japanese versions of the game. 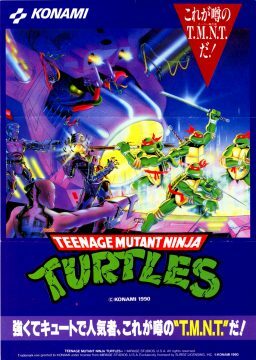 In Japan, it was released as simply Teenage Mutant Ninja Turtles, since first game was treated nearly as a different property altogether. 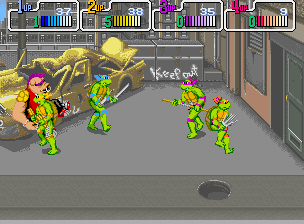 As with the very first TMNT game in 1989, The Arcade Game saw numerous home computer ports. Developed largely by Probe Software with porting assistance from Mirrorsoft, these ports were based around the arcade version, as Nintendo exclusively owned the material developed for their system. The initial code was written from the DOS version, and all the subsequent computer releases were based around the DOS code. You might think that this time, the developers had more time to prepare for the game’s release and port the game successfully over, capturing the magic of the arcade’s simple yet addicting gameplay to the stronger home computer systems? Well, that was certainly not the case. The first impressions might be impressive enough, with graphics faithful to the arcade game. But the horrors start here. First of all, and most glaringly of all, the music. See, this game has one track, and one track only. And if it was an iconic, catchy and diverse track, maybe it could be excused and tolerated. Sadly what we have here is failure to produce anything near being tolerable, sounding like a crude dude passing gas along a Looney Tunes melody and sampled into the game. And it never stops, absolutely never, not between stages, not during boss fights, not at the end. It just never stops. It never ever stops. The animations and controls are just as atrocious, and are far worse than the NES game by miles and miles. It’s like for every movement any character makes, it’s missing 10 out of 15 frames in the animation and feels nauseating to watch. The sound effects are simple claps and swooshes that sound as out of place as that damn music. Did we mention that the one track in the whole game never stops playing? The music sounds like something that should be in Beverly Hillbillies The Game, not Ninja Turtles. For some reason, the turtles themselves are left out of the cutscene during the transition from level 1 to 2, leaving Shredder and April the only characters in frame and apparently free to get away as far as preferable. Most peculiar. The Amiga version is handled a bit better on the surface, cleaning up the graphics a bit. The title screen has one of the cruelest teases in game history, as it states the music is done by legendary Jeroen Tel. Well, he did compose a rather bland original title theme, but that’s it. Yes, instead of just one song throughout the whole game, or porting the great soundtrack over, this version has no music whatsoever. Such a massive disappointment considering the potential of Tel’s talent and capabilities. The game itself is just as dogged down as the DOS port, with crippling difficulty and even less animation than before. The Atari ST fares better than both DOS and Amiga, but not by much. 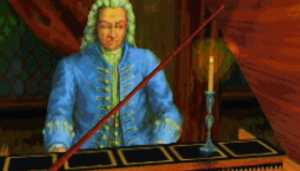 Suffering from many of the same problems as the Amiga with awkward scrolling and little animation, there is at least a few songs played throughout the game. The music isn’t all that special, but it’s not bad at least. The controls and difficulty is also a bit more manageable compared to the Amiga. The Amstrad CPC brings the game closer to a playable state, thought with heavily reduced detail. The animation flows much better, the graphics are fine enough considering the system even though it runs on a smaller window, and it controls just alright. There’s almost no sound whatsoever to be found in the entire game, outside of a few high pitched clicks when you connect a strike. The Commodore 64 version differs in many aspects from the rest of the PC ports. Lacking the capabilities to run large sprites and layers of animation, the whole graphical scheme has been redone specifically for the C64, and the result is a game that visually fits in well with the library and has a unique look to it compared to all the other versions available. The characters have even been retooled and now have individual qualities, such as Don having longer reach and better strength. The soundtrack has also been completely changed and while it doesn’t live up to the original, it’s cool in its own right with some pretty catchy tunes and good clear sound effects. The music was once again handled by Jeroen Tel. The controls are a tad bit stiff as to be expected with C64 games, but all in all, outside of the NES game, this is the only version worth owning as it differs enough from the others to feel special enough. 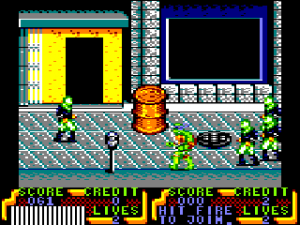 The ZX Spectrum edition of the game is a port of the Amstrad CPC’s game, though with only two colors. This allow for more clear detailing on the sprites, and it looks more like a decent handheld game. Like on the Amstrad, this version feels alright and doesn’t offend as much as the Amiga and DOS. All of these versions were released in the same time frame of one another, right behind the release of the NES version. The home computer ports were reasonably easy to locate throughout European game shops, though went largely unnoticed in the US market. This has led a few of the games to become rare and sought after as collector items in recent years, despite their questionable quality. 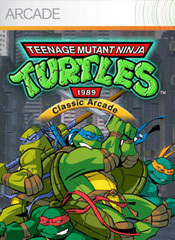 In 2006, hobbyist programmer Jason Orme started work on a recreation of the 1989 arcade TMNT engine in order to have a fully functional and sourced version of the ever popular game, and also the ability to add all new levels, sprites and other user content into the game. 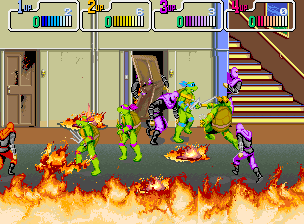 The work on the engine is described as a way for Orme to develop his own skill and eventually enable for all new TMNT fan games with the ability to meet the high quality of the original. Work is still in relatively early stages, with many effects, characters and mechanics entirely missing. In the playable release, only Leonardo is selectable, and most of the effects in the game are static or not working properly. The engine is prone to crashing on sudden changes to music or enemy appearances as well, and some are lacking proper hit collision parameters. Still, the work done so far is fairly impressive, and with the prospect of one day being able to port the game in arcade perfect form and add user content certainly allows for some very interesting ideas for the future. It has not seen any public update since early 2009 however, so it is unknown whether Orme has abandoned the project altogether or has simply been silently at work.